A slightly smaller turnout than for last months quiz but once again a good evening with John Barratt as question master and food kindly provided FOC by Dave and BJ. 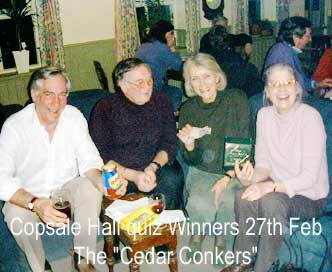 Winners of the quiz were the Cedar Conkers. They also won some valuable raffle prizes donated by members of the committee. Jim looks quite ecstatic with his jar of pasta sauce.